Interested in Becoming a Take Charge of Your Health Workshop Facilitator? Watching someone experience a light bulb moment is very special. 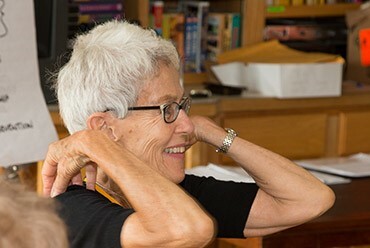 Workshop Facilitators often comment on the joy that it brings them to see participants realize that they can manage their own ongoing health conditions. Workshops are led by a team of two trained facilitators. Facilitators come from a variety of backgrounds and it is not necessary to have a job in the health professions to qualify as a workshop facilitator. Learning from the other people in the workshop is a crucial piece of the process. Therefore, in each two-person team, at least one facilitator should have experience with an on-going health condition. This increases the two-way connection between facilitators and participants, and encourages everyone to share experiences and solutions. Complete four full days of training. Complete one workshop within six months of finishing the training. Have an agreement with a licensed organization they will work under while conducting workshops. Copies of the most recent edition of the "Living a Healthy Life" and "Relaxation for Mind and Body" CD for each participant will be provided to you for use during the workshop by either your program coordinator or an AgeOptions staff member. All workshop facilitators are provided instruction on how to arrange for materials during the 4-day facilitator training. Hear from long-time volunteer- Valerie! Interested in Becoming a Matter of Balance Coach? It is so gratifying to see how participants in A Matter of Balance learn from one another, become more aware, stronger, and more confident. Workshops are led by a team of two trained coaches. Coaches come from a variety of backgrounds and it is not necessary to have a job in the health professions to qualify as a workshop facilitator. Learning from the other people in the workshop is a crucial piece of the process. Therefore, in each two-person team, at least one coach should have experience with falls. This increases the two-way connection between coaches and participants, and encourages everyone to share experiences and solutions. Complete 8 hours of training. Complete two workshops within 12 months of finishing the training. Have an agreement with a licensed organization with a Master Trainer they will work under while conducting workshops. Complete 2.5 hours of update training annually. When you're ready, complete the Matter of Balance coach application and someone will get back to you as soon as possible.